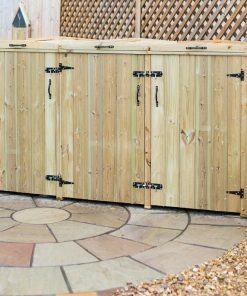 If you're investing in a great new bin store, then you might want to think about building a base for your new garden accessory. Bin store deck bases are available to buy (we can supply them, just ask), which is a quick and convenient option, but you can also make your own if you're feeling handy! 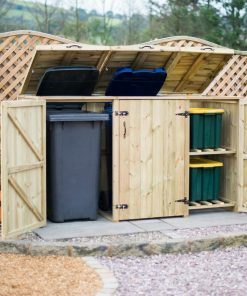 We're here to tell you all you need to know about building a bin store base, so keep reading! There are a few reasons why you might want to build a base for your new bin store. Firstly, a solid base will make your store level and keep it stable. Secondly, a base will protect the wood of your store from the damp ground, thereby making it last longer. A base is also easier to clean than bare ground is. You can have a bin store without a base, but it's really not recommended. Wheeling bins in and out of a store on mud, gravel or grass is difficult, so a decent base is fairly important. Your first step is going to be choosing a location for your base, and this requires careful thought. You'll need a fairly level piece of land that's slightly bigger than the store that you've chosen. When taking measurements, don't forget to take into account the doors of the store, since you'll need plenty of room to open them and pull bins out. You'll also want to think about convenience. Whilst it might be nice to put your bins at the bottom of the garden out of sight, that's not particularly practical. Remember that you need to take rubbish to the bins regularly and pull the bins out at least once a week, so closer to the house is probably a better option. Finally, consider the kind of bin store that you're buying. All our bin stores are free standing and covered on all four sides, and these can go pretty much anywhere. However, if you're getting a cheaper bin store like the Rowlinson models available that are three sided it will need to be placed against a wall or fence to cover that back. Once you've chosen your ground then you'll need to do a little prep work before building. Dig up any grass or turf on the area, and use a hoe to break up clumps and get rid of stones, then a rake to nicely level off the land. If necessary, trim back bushes or trees that are in the way. All set? Then you're ready to get to building. When it comes to building bases for garden accessories there are really three main options: timber, slabs, or concrete. Of these options, timber is not especially well suited to bin stores, since gaps between planks make wheeling bins out difficult. You can potentially build a solid wood base (like a deck), but this is liable to cost you more than simply buying a ready made base. Of the other two options, either will do, depending on what kind of skills you have and where you want to put your base. Paving slabs make a great base, and require less skill to lay than a concrete base does. You'll need enough paving slabs to cover the area that you need, and slabs should be laid on a base of sand and/or dry mix cement. The most important part here is to make sure there's a slight ‘fall' for drainage so that water doesn't pool around the bin store. This is quite each to achieve and this guide will help you get the right run off. A concrete base requires a little more know how, but when done correctly gives you the best and flattest surface for your bin store, which makes wheeling bins around a lot easier. The first thing you'll need to do is to mark out a square that is around one inch bigger on all sides than the base of your chosen bin store. Once you've done this, mark out another square that is around six inches bigger on each side than your smaller square. Now it's time to dig. You'll need to dig out the larger square completely, down to a depth of around three inches or so, and then you'll need to level out the ground again. Now you can frame the square where the concrete will go. Using timber that's as wide as the depth you wish to pour (about three inches), frame up the smaller square that you marked. During this process it's best to double check your measurements! Once your frame is put together you're ready to fill it with concrete. Concrete is made of three ingredients: cement, ballast and water. You'll need a ratio of about five parts ballast to one part concrete. Ballast is usually sold in 40 kilo bags, and 1.25 bags makes about 1 cubic foot of concrete. Mix your two dry ingredients together and then slowly add in water until the mixture is even in colour and workable, but not liquid! Pour your mixed concrete into the frame you built, using a special tool called a rammer to press it down and into the corners, tap on the wooden frame with a hammer to get out bubbles and ensure a straight edge. You can add more layers if necessary until you get the desired depth. Once the concrete is level with the top of your framework, smooth it out using a long piece of wood, then sit back and wait for it to dry! Your best bet is to cover the slab you've made with plastic and spray it with water a couple of times a day so that it dries out slowly and doesn't crack. After four days or so you can remove the framework and your base is complete!